Congratulations to all runners who registered for the 37th Annual Marine Corps Marathon on Sunday, October 28! 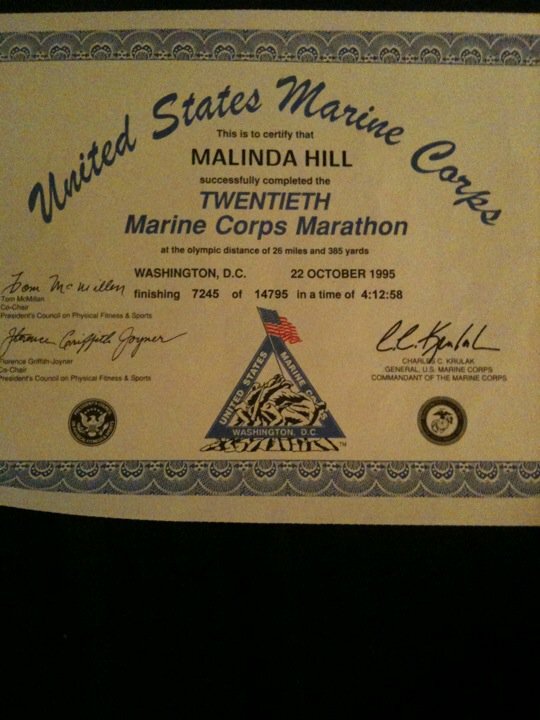 The 20th Marine Corps Marathon was my 1st Marathon and I finally found my Finisher's Certificate from 1995! I've completed seven marathons since and I hope to run the 40th Annual Marine Corps Marathon in 2015! It is a great marathon - especially if it's your first! I registered for the Chicago Marathon this year. We would loooove to run it! Just not in the cards for us this year though! Love your certificate! Holy geez, you're fast! :) My full PR is Disney in 2011 at 4:58. I'm hoping to break 4:30 at some point but not sure when. Doubt it'll happen at Goofy 2013. Would love to run MCM again, maybe I'll do it again in 2015 too!